The peppery vegetable, scientifically named Raphanus sativus, comes in a variety of colours, shapes and sizes. Most commonly, however, they’re small, rounded and reddish. The benefits of this superfood can be obtained by consuming not only the radish roots, but also the flowers, leaves and seeds. Radishes are great at detoxifying the body, as well as improving the liver and stomach functions. One satisfying crunch will help purify your blood and increase oxygen into your bloodstream. It’s also a natural diuretic, helping to release ‘pollutant’ substances in the body by increasing the production of urine to eliminate toxins. When your goal is weight loss, radishes are a good ally. Not only does the vegetable provide a sense of fullness, it’s also rich in fiber, promotes a healthy digestive system, bumps up your immune system and reduce some types of cancers and inflammation. Pain, swelling, sore throats, infections and even fever can be tamed with the aid of this amazing superfood. To truly experience the intensity of the edible root, the best way to enjoy it is raw. Sliced up into salads is best. However, to get creative and explore new flavours, our special recipe by Stacey from www.goonessis.com will certainly do the trick. Radishes are perhaps the easiest vegetable to grow. Scatter the seeds on bare soil and three weeks later they will come. Growing radishes is an excellent way to break up the soil for other crops. 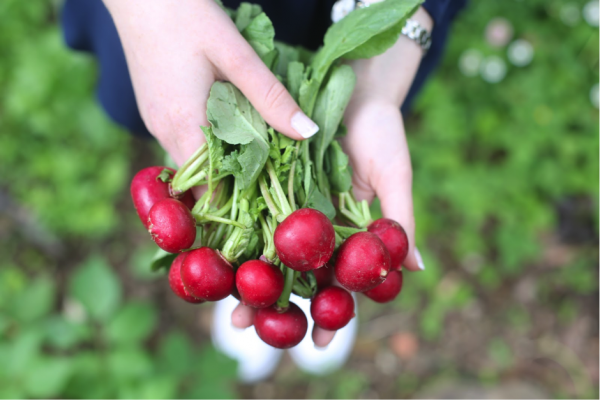 Radishes are ready to pick when you see their shoulders nudging through the surface of the soil. Young radishes taste sweeter while older radishes taste hotter. Remember not to leave them too long in the ground or they will become hollow or woody. 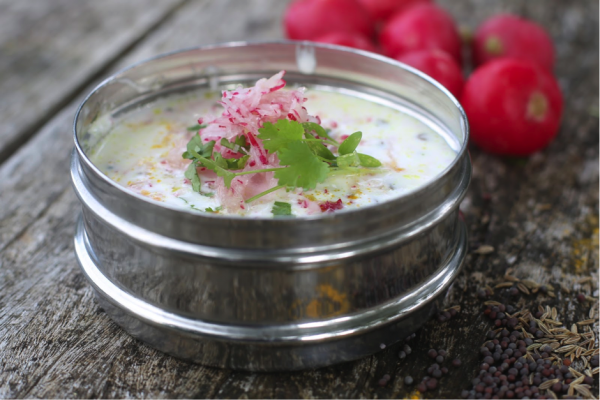 Radishes are best eaten young and crisp, they are a wonderful addition to salads, grain dishes, added in sandwiches or grated like in this raita. Radish leaves are delicious finely chopped in salads. Only use radishes with bright green leaves. Don’t bother including them in the salad if they’re wilted or yellow. Radishes sautéed in a little ghee or butter for 10 minutes until slightly translucent & tender are very good, they become tender, mellow, even a little sweet in flavour. Raita is a very soothing dish, with the overall property of being cooling for the body. It is recommended to serve with 1 - 2 cups of cooked rice, and becomes a very cleansing & satisfying meal to have in the evening. In Ayurveda it is said to evoke a good night sleep. For a variation on taste ¼ tsp lemon juice can be added and can be made with grated cucumber or carrot instead of radish. This raita can be used as a dressing over a salad, or roasted vegetables or accompanied with a spicy rice/grain dish or dahl. The curry leaves can be found at your local Indian Store and when stored in the freezer keep their flavour up to 6 months. After fried briefly in oil they become a uniquely flavourful, and a crunchy surprise, as well as benefiting from their wonderful medicinal qualities. Use heaped spoon measurements unless otherwise stated. In a medium bowl, whisk together the yogurt and water until well combined. Grate the radish and ginger using the finer side on a box grater/ parmesan grater. Stir into the yogurt, and add the salt. Set aside. Tear each curry leaf into four pieces. Set aside. In a small pan over medium heat, add the oil and mustard seeds. When the seeds start to splutter and pop, (It is important to fry the mustard seeds well otherwise they will taste too astringent), add the cumin seeds, curry leaves and turmeric powder and fry for 30 seconds, swishing the pan around to allow for the spices to fry evenly. Turn off the heat, add ¼ cup yogurt mixture into the voggarane, swishing the pan around to combine. Pour into the yogurt mixture and mix well. Garnish with fresh coriander and radish slices.